Jesus asked, “What profit would there be for one to gain the whole world and forfeit his soul?” (Matthew 16:26a). These words were repeated to a young teacher of philosophy who had a highly promising career in academics, with success and a life of prestige and honor before him. Francis Xavier, 24 at the time, and living and teaching in Paris, did not heed these words at once. They came from a good friend, Ignatius of Loyola (July 31), whose tireless persuasion finally won the young man to Christ. Francis then made the spiritual exercises under the direction of Ignatius, and in 1534 joined his little community (the infant Society of Jesus). Together at Montmartre they vowed poverty, chastity and apostolic service according to the directions of the Pope. 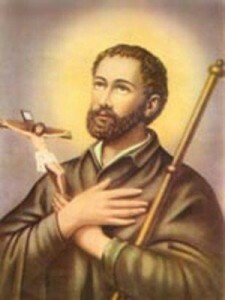 From Venice, where he was ordained a priest in 1537, Francis Xavier went on to Lisbon and from there sailed to the East Indies, landing at Goa, on the west coast of India. For the next 10 years he labored to bring the faith to such widely scattered peoples as the Hindus, the Malayans and the Japanese. He spent much of that time in India, and served as provincial of the newly established Jesuit province of India. Wherever he went, he lived with the poorest people, sharing their food and rough accommodations. He spent countless hours ministering to the sick and the poor, particularly to lepers. Very often he had no time to sleep or even to say his breviary but, as we know from his letters, he was filled always with joy. Francis went through the islands of Malaysia, then up to Japan. He learned enough Japanese to preach to simple folk, to instruct and to baptize, and to establish missions for those who were to follow him. From Japan he had dreams of going to China, but this plan was never realized. Before reaching the mainland he died. His remains are enshrined in the Church of Good Jesus in Goa. He and St. Therese of Lisieux were declared co-patrons of the missions in 1925.